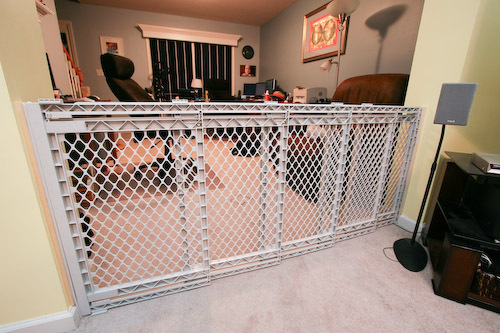 Now that David is quite proficient in crawling all over the place we decided it was time to put up one of the baby shower gifts – the Supergate V.
What makes the Supergate V so unique is its extra wide spanning capabilities, up to 5 feet. Too bad we have a 6′ doorway! 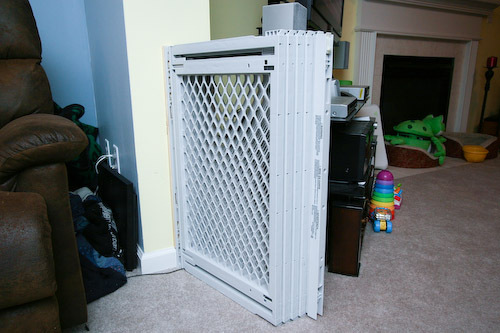 Upon discovering the gap, I ran out to Baby’s R Us and purchased a second one to cannibilize for parts. I present the 6′ wide Supergate! Notice the 5 panels instead of the stock 4. Nice. Installation took a while because it is designed to be attached to the wall instead of being held by pressure and friction. Since this opening isn’t a traditional “doorway”, I had a small problem of baseboard trim to deal with. 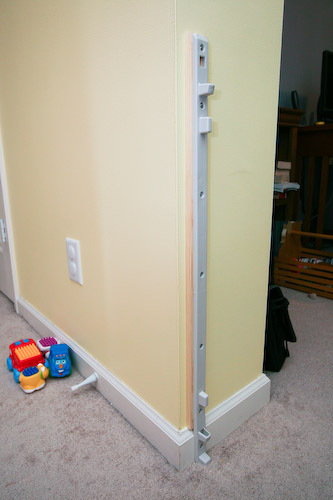 To compensate, I had to rip a couple pieces of wood to be 1/2″ thick and attach them to the wall first. It took a bit longer than I expected when I opened the box up tonight, but it’s done and looks as good as a big gate can look. No more crawling right into the office! We’ll have to get David a laptop so he can still compute – just without the wires and powerstrips!